Game of Thrones is about to return for its final season. It's going to be unavoidable. But it seems that being almost omnipresent isn't enough. All things must be Game of Thrones things in 2019. That was evident during the Super Bowl on February 3, when The Mountain and Drogon showed up to kill off Bud Light's the Bud Knight in a commercial. Not satisfied with killing off the Bud Knight, the show inserted itself into the beefiest Twitter feud running. Wendy's and Burger King have long had a frosty relationship on social media. (Though, everyone knows that's mostly just Wendy's doing its usual thing where it relentlessly trolls people whether or not there's a good reason.) 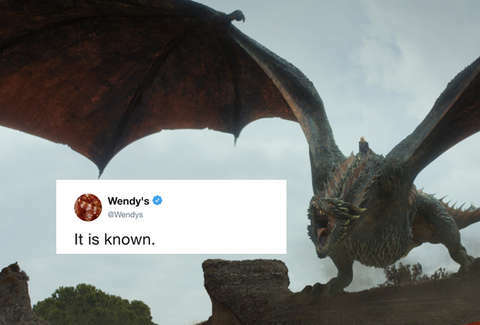 After the Game of Thrones x Bud Light Super Bowl commercial, Wendy's tweeted to the show's official account asking if they could "do the king next." Any man who must say "I am the king" is no true king at all. The show's account surprisingly responded to Wendy's, implying that the Burger King isn't royalty they recognize. "Any man who must say 'I am the king' is no true king at all," it wrote. Burger King can't catch a break. Andy Warhol made a posthumous appearance in the chain's Super Bowl ad, which used archival footage that showed the artist eating a Burger King burger. However, the industry publication AdAge revealed the actual story behind that footage had Warhol asking for McDonald's before settling for the BK. Maybe it was an off-hand remark from the GoT account, maybe it's a preview of something on the horizon, unlikely as it might be. Either way, it'd probably be more satisfying if Drogon kept roasting Lannisters and wights rather than corporate mascots.